Austin Psych Fest 3 is over … but it’s never really over, is it? Attendees and other interested parties will likely spend the intervening 11-and-a-half months digging further into the make-up of the bands they were introduced to via the Austin Psych Fest, before starting the entire process over again next year. Further investigation is definitely needed with Iowa’s Mondo Drag, who wowed the Psych Fest crowd by looking like they just rolled up in Spicoli’s van, before casually striding on to the stage and attempting to draw down the moon (in the late afternoon sun, no less) via the overwhelming power of metaphysical riffing. As exemplified on the title of their debut album, “New Rituals,” aren’t afraid to take some cues from the past, while slipping (slipping, slipping) into the future. Singer/drummer Johnnie Cluney was kind enough to partake in the interview ritual with us. 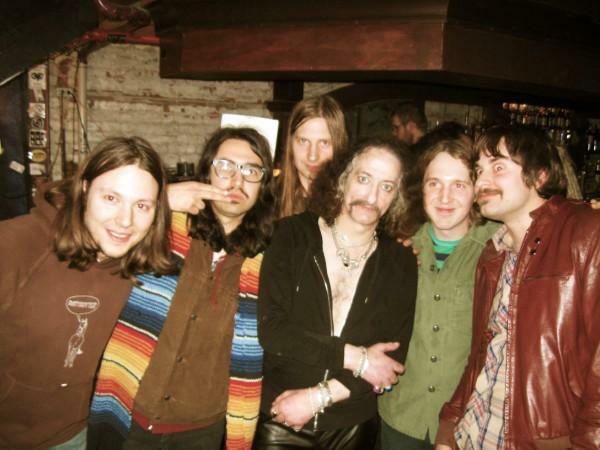 The history of killer, heavy psych rock coming out of Iowa is … well, you tell us. 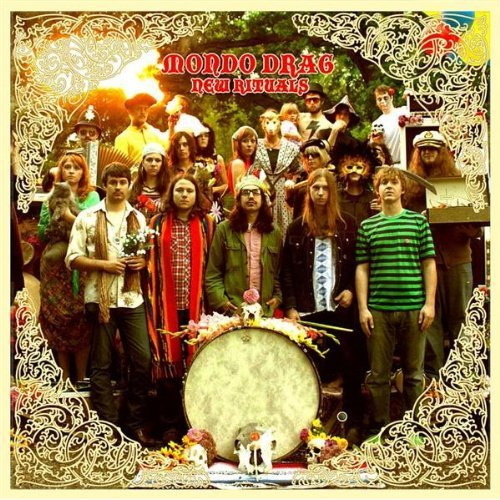 Is there a too-ignored sect of bands from Iowa that inspired Mondo Drag at the earliest stages? Or was it the aim of Mondo Drag to do its part to put Iowa on the map? It's the sign of the wolf! The Mondo Drag wolf!!! Yeah, not a real strong history for Iowa psych rock. There are a hand full of bands from our area that we like, but I can’t say that we were influenced by any of them. We have always just done our own thing. I think when we found out about Radio Moscow we were stoked. We played what I think was our third show with them – it was right after they recorded their first LP, so prob about four years ago now. Radio Moscow lives in California now so Iowa is all ours! Are you all from Iowa originally? How did Mondo Drag come together? Did you play in other bands together beforehand? We all grew up on the Illinois side of the quad cities. Half of us live in Iowa now. We are divided by the mighty Mississippi river, a hidden paradise, really. Mondo Drag was put together in mid-2006 by Johnnie Cluney, Jake Sheley, and Nolan Girard. Our setup for the first year and a half was two guitars and drums. Our demo CD, “Holy Spirit,” is just a three piece with tons of overdubs. As far as playing in bands together, here’s a short history: Jake and Jon grew up worshiping Iron Maiden and Judas Priest together, Nolan and Johnnie played in bands in high school, Jake was playing guitar in Johnnie’s folk band, and Dennis and Johnnie play in an electronic jam project currently. How’s that? What were the most important or transformative musical experiences you had growing up? How have those experiences contributed to the story of Mondo Drag? Good question. I think we can all answer this differently. I had a lot of these moments growing up. I remember the first radio song that I really was confused by was “Come Together” by The Beatles. I thought it was a tape that had been warped because of the tempo, I could not understand it! I ended up getting “Abbey Road” on cassette and it quickly became my bedtime tape. I would play it all night through, and it’s still my favorite Beatles album. I think all of us have had these personal sort of religious experiences with music, and it has set us free to just make “our” music. No rules! How many transvestites show up by accident at your shows, expecting to see some truly mondo “drag”? Only one so far and she played my drums in her surf band! Watch my heads, babe! I find your debut album to be ultimately very difficult to describe – but essentially containing all of the elements I love about heavy, psych-damaged music from the 60’s and 70’s. Was there an overriding theme you guys were attempting to express on the album, or was it more of a case of, “Let’s just get these songs recorded”? Yeah, there’s a lot on there. We are all music nuts. We’re into it all. Mondo Drag has and always will make whatever kind of record we want to. It’s all about making an album that will withstand the hands of time. You just gotta bring it. In the same way, I love the title of the album, “New Rituals.” It brings to mind both the old (rituals) and new (uhhh … “new”) that goes in to your music. What does the title mean to you? And what about the cover – is that Sgt. Mondo’s Lonely Quad-Cities Band? The title “New Rituals” to us means exactly that. The word new really makes you think, and I chose that word for this reason. The ritual part is just whatever you do- whether it’s praying, making coffee, helping out a friend, making art, listening to music, etc. It’s just something that you find sacred enough to put time aside for. As far as the cover goes, I was trying to incorporate all types of “rituals” or “happenings” and bring them together. It was a lot of work to get all those people and props together – getting the snakes was the hardest part. The cover has been called the poor man’s “Sgt. Pepper” – pretty good. Having only had the pleasure of seeing Mondo Drag live on a single occasion, I get the sense that the band is pretty well-equipped to play sets with varying levels of improvisation and heaviness. Is that the case? I ask because your Austin Psych Fest 3 set seemed perfectly tuned to a late-afternoon, lazy Sunday vibe. Yeah, I mean, every show is different. You have to be ready for different sized rooms and PA’s. It takes awhile to be able to control a room – I think we’re still getting there. What is your favorite show you’ve done so far with Mondo Drag? My personal favorite show with Mondo Drag was in Chicago at the Mopery a couple months back – it was pretty balls out. What music have you been listening to lately? What’s one album that you would have never thought you would like, but became one of your favorites? Push comes to shove, what is your favorite Beatles song? Hmmm … well, at the moment, I’m into Ra Ra Riot and Free Energy. I was on a tour all week with these guys. I did not think that the sugary sweet indie pop could get to me, but alas, I own both records. And favorite Beatles song? I guess I’ll say “Glass Onion” – ask me on another day and I’ll tell you something different. What’s next for Mondo Drag? We’re going to play a few local show this summer. We really do not play locally too often. We are working on tours in June and September and we have begun writing new songs for a new LP. No rest for the wicked!